Inyo County is a large county in eastern California. Everything about it is vast. It has the highest mountain in the continental United States (Mt. Whitney) and the lowest spot on the continent (Death Valley). It has Bristlecone Pines in the White Mountains that are among the oldest living things on earth. 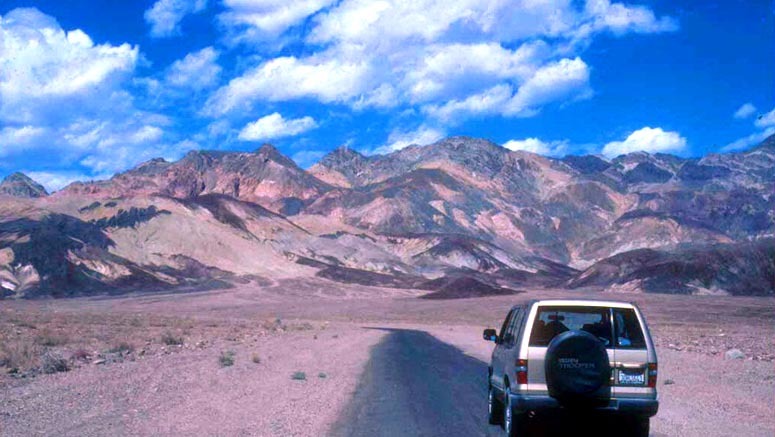 Death Valley National Park contains a vast amount of wilderness. There are ghost towns, dried up ghost lakes, and the Owens River. Aside from my home county (Monterey), Inyo and adjacent Mono counties are my favorite birding spots in the State. Inyo County was created in 1866 from chunks of then-existing Fresno, Tulare, Los Angeles, and San Diego counties. There is an (almost) straight line across California, formed by the Sixth Standard Parallel which is the northern boundary of San Luis Obispo, Kern, and San Bernardino counties. Everything south of this line is considered to be "Southern California." Inyo lies entirely north of this line, yet it is also appended to Southern California, at least from the birders' perspective. This is a traditional anomaly: in the early days, it was always southern California birders who worked Death Valley, before there were any local Inyo Co. birders. Death Valley has many now-famous birding spots: Furnace Creek, Stovepipe Wells, Mesquite Springs, and Scotty's Castle among them. 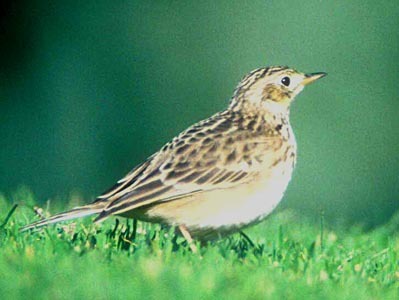 County birding statistics and links are on Joe Morlan's site. Many of the major Inyo County birding sites, away from Death Valley, are highlighted on the Eastern Sierra Audubon Society site. For Inyo County the choices include many rare vagrants, and since so much of my birding there has been in search of such rarities, let's just paste some of them here. 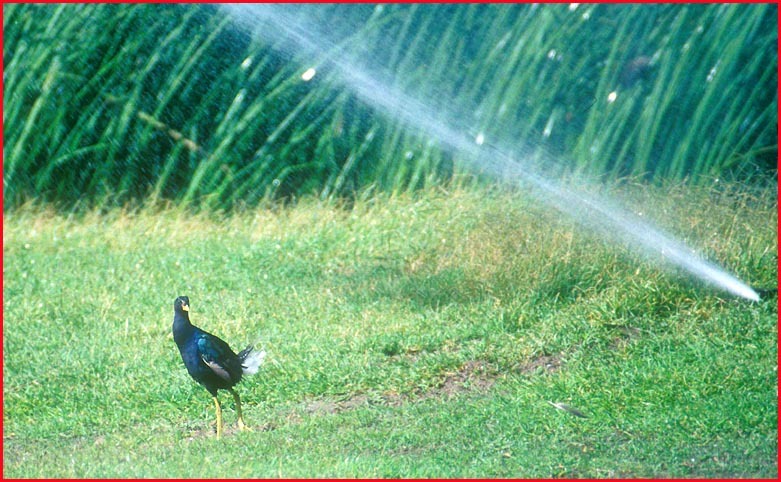 The top photo is of a Purple Gallinule (only a half-dozen State records) walking past a hard-spraying sprinkler at Furnace Creek Ranch. It was such a weird sight to see this tropical gem striding across a desert golf course. Another photo from Furnace Creek is below (left), this one a vagrant from the northern Great Plains: a Sprague's Pipit (). It was there the same day as the PUGA (11 Oct 1997). For my final photo (below right), I show the male Varied Bunting that Donna Dittmann and I found at Mesquite Springs way back on 18 Nov 1977. 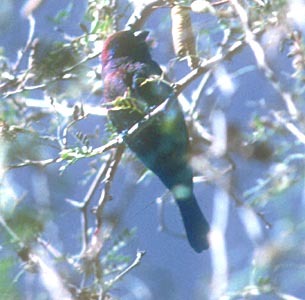 It was the first 'chaseable' Varied Bunting in California, remaining a few days for those willing to do all-night drives, and has not reappeared since. Inyo County has wide open spaces and many startling vistas. Here are just a few: top — Artist's Drive in Death Valley National Park (June 1997); middle — dawn at Furnace Creek golf course, the site of many discoveries of rare birds (1 June 2004); and bottom — a view of the eastern Sierra Nevada from a back road near Tinnemaha Reservoir (1 Apr 2005). Elsewhere on these web pages is a gallery of photos of the wildflower show in Death Valley in spring 2005.